The calculation widget above allows musicians to compare their profits with Resonate versus our competitors. We chose to go with a rate of $.006 per-stream to represent the competition for a number of reasons. Apple Music comes in around 0.005643 but it’s been VERY hard to find many references. Numerous reports put Tidal rates around .012 per-stream, maybe because they’ve got a $20 a month version of their service. Their market share isn’t anywhere near Spotify’s, so we don’t let that skew the math in the other direction too much. And then there’s YouTube. Fact is, streaming music on YouTube vastly outweighs the other platforms. We’ve seen better data, but this article will suffice for now. Their most often quoted rates? Around 0.001 per-stream. 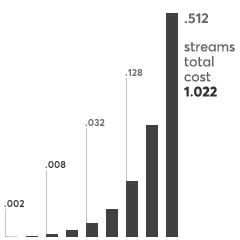 So with YouTube on a miserably low end, Spotify and Apple in the middle and Tidal on the high end, we end up with a basic average of $.006 per-stream by comparison. As most everyone knows, Resonate has a very different listening concept known as stream2own. In this model, the first play starts out really cheap (at .002) and then doubles until reaching just over one unit – the price of a normal download. The idea being here that half of the people that listen to a specific song once, 20% listen a second time, 10% will listen a third time, etc. Obviously we have no way of knowing exactly how this will actually break down. But even if the percentages are slightly different, it’s quite clear that musicians stand to make a lot more with Resonate than Spotify. Considering the fact that we also have the potential to reach an even larger market than many of our competitors, shows that our fair trade music philosophy isn’t just the right thing to do, it’s potentially MUCH more profitable for all concerned.